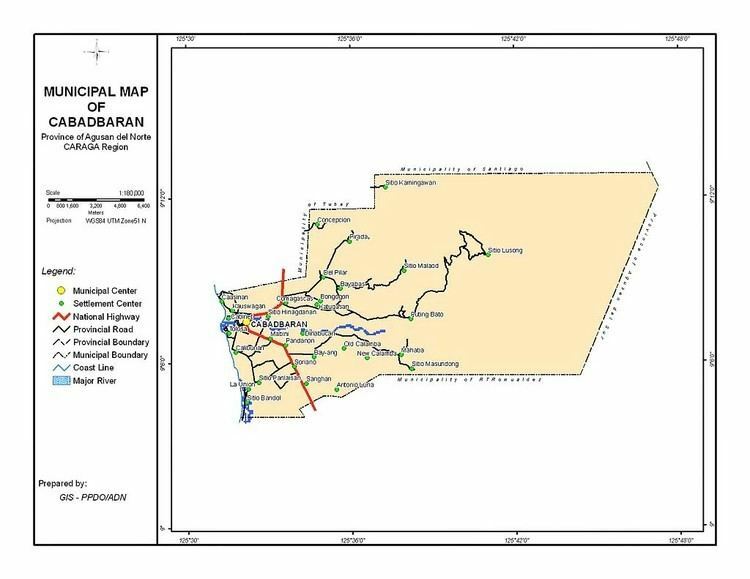 Cabadbaran is a sixth class city and the provincial capital of Agusan del Norte, Philippines. It has a population of 69,241 according to the 2010 census. Founded in 1894, the city rose from its Spanish period beginnings to become the premier town of Agusan del Norte. 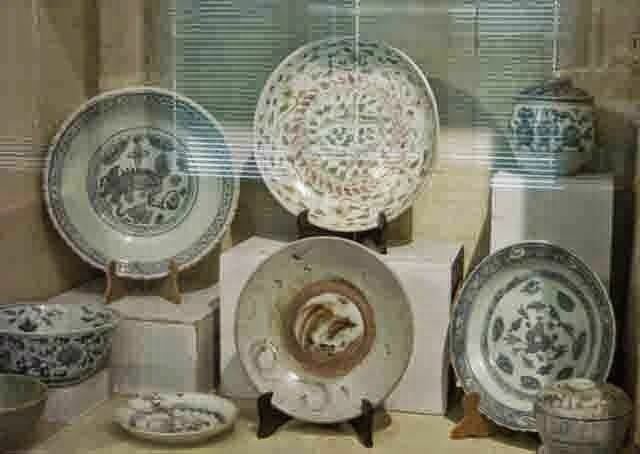 Its rich cultural heritage is evident in its preserved colonial period houses and its archaeological collections. Following its recent declaration as a city, it is also the officially designated capital of the province per Republic Act 8811. Cabadbaran lies 9 degrees north latitude and 125 degrees and 30 minutes east longitude in the northeastern part of Mindanao. Its boundaries are Tubay to the north, Butuan Bay to the west, Magallanes to the south, Madrid (Surigao del Sur) to the east. It is 29 kilometres (18 mi) from Butuan City. It is generally flat with rolling hills and swamplands in its western part. The highest of all mountains in the Caraga Region, Mount Hilong-Hilong (with an altitude of 2,012 metres (6,601 ft) above sea level), rises in this city. During the 11th Congress (1998–2001), Congress enacted into law 33 bills converting 33 municipalities into cities. However, Congress did not act on a further 24 bills converting 24 other municipalities into cities. During the 12th Congress (2001–2004), Congress enacted into law Republic Act No. 9009 (RA 9009), which took effect on 30 June 2001. RA 9009 amended Section 450 of the Local Government Code by increasing the annual income requirement for conversion of a municipality into a city from ?20 million to ?100 million. The rationale for the amendment was to restrain, in the words of Senator Aquilino Pimentel, "the mad rush" of municipalities to convert into cities solely to secure a larger share in the Internal Revenue Allotment despite the fact that they are incapable of fiscal independence. After the effectivity of RA 9009, the House of Representatives of the 12th Congress adopted Joint Resolution No. 29, which sought to exempt from the ?100 million income requirement in RA 9009 the 24 municipalities whose cityhood bills were not approved in the 11th Congress. However, the 12th Congress ended without the Senate having approved Joint Resolution No. 29. "Exemption from Republic Act No. 9009. — The City of x x x shall be exempted from the income requirement prescribed under Republic Act No. 9009." On 22 December 2006, the House of Representatives approved the cityhood bills. The Senate also approved the cityhood bills in February 2007, except that of Naga, Cebu which was passed on 7 June 2007. These cityhood bills lapsed into law on various dates from March to July 2007 after President Gloria Macapagal-Arroyo failed to sign them. – and in each case the established criteria were far from met. In November 2008, Cabadbaran lost its cityhood, along with 15 other cities, after the Supreme Court of the Philippines granted a petition filed by the League of Cities of the Philippines, and declared unconstitutional the cityhood law (RA 9434) which had allowed the town to acquire its city status. The Supreme Court ruled that they did not pass the requirements for cityhood. On 10 December 2008, the 16 cities affected acting together filed a motion for reconsideration with the Supreme Court. More than a year later, on 22 December 2009, acting on said appeal, the Court reversed its earlier ruling as it ruled that "at the end of the day, the passage of the amendatory law" (regarding the criteria for cityhood as set by Congress) "is no different from the enactment of a law, i.e., the cityhood laws specifically exempting a particular political subdivision from the criteria earlier mentioned. Congress, in enacting the exempting law/s, effectively decreased the already codified indicators." Accordingly cityhood status was restored. But on 27 August 2010, the 16 cities lost their city status again, after the Supreme Court voted 7-6, with two justices not taking part, to reinstate the 2008 decision declaring as "unconstitutional" the Republic Acts that converted the 16 municipalities into cities. A previous law required towns aspiring to become cities to earn at least ?100 million annually, which none of the 16 did. On 15 February 2011, the Supreme Court made another volte-face and upheld for the third time the cityhood of 16 towns in the Philippines. We should not ever lose sight of the fact that the 16 cities covered by the Cityhood Laws not only had conversion bills pending during the 11th Congress, but have also complied with the requirements of the LGC prescribed prior to its amendment by R.A. No. 9009. Congress undeniably gave these cities all the considerations that justice and fair play demanded. Hence, this Court should do no less by stamping its imprimatur to the clear and unmistakable legislative intent and by duly recognizing the certain collective wisdom of Congress. WHEREFORE, the Ad Cautelam Motion for Reconsideration (of the Decision dated 15 February 2011) is denied with finality. So affirming the finality of the constitutionality of the 16 cityhood laws. On 28 June 2011 the Supreme Court directed the Clerk of Court to issue forthwith the entry of judgment on the cityhood case of 16 municipalities. Sealing with "the finality of the resolution upholding the constitutionality of the 16 Cityhood Laws absolutely warrants the respondents??? "Motion for Entry of Judgment", the SC ruled." This entry of judgment ended the cityhood battle of the 16 cities in the Philippines. NB The income classification limits have been revised more than once since RA9009. The city has a booming economy based on agro industry, commerce and trade, source of several export and industrial products; it has also varied ecotourism destinations ranging from Caragas highest peak, mile long tunnels to adventure tourism sites. Charter Day Celebration - held annually every July 28 to commemorate the cityhood of Cabadbaran. Dagkot Festival - It is the sole important event during the fiesta celebration of Cabadbaran City. 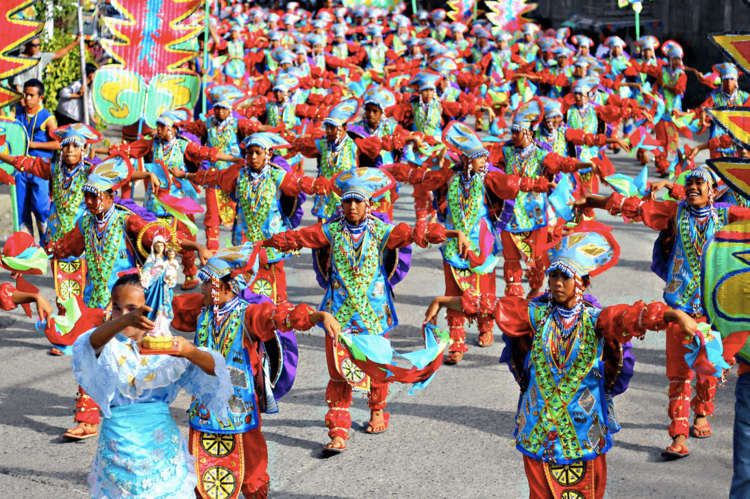 The weeklong festivity features socio-civic activities, sporting events, trade fairs and capped by a grand street dancing parade and competition to celebrate the historic past and the bright future that awaits the city also in honor of Nuestra Seniora de Candelaria.